I believe that there will be a cure for some kind of cancer within my lifetime. As a two time survivor, I can tell you that early detection means a longer life. It was an article in GQ, believe it or not, that got me thinking I might be really sick. Sometimes the information you need turns up in the strangest places. Today is the start of Breast Cancer Awareness Month. Statistics say that 1 in 8 women will get the disease. And lest you think that this is a woman’s issue, I will tell you that whole families are impacted by cancer, wherever and in whomever a tumour is found. But together, we will make a difference. If you have a loved one or friend who is fighting against the disease, let them know that you’ve got their back so that they can continue to fight to the front with everything they’ve got. Get checked by a doctor. Do not delay. Raise awareness, even if it’s just by wearing a bit of pink today. 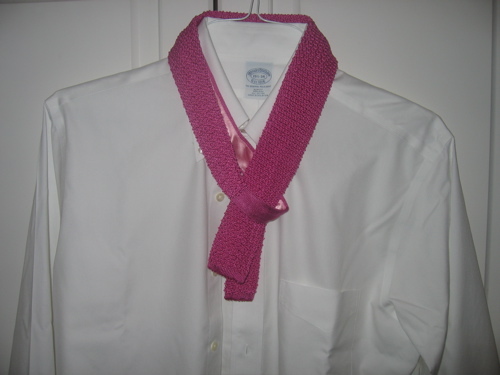 This entry was posted in Uncategorized and tagged Breast Cancer Awareness. Bookmark the permalink. Chris – a wonderful message and a terrific image. Thanks so much. I have an appointment for my yearly checkup tomorrow! As a survivor myself, I too am hopeful we’ll see a cure for cancer in our lifetime. I know if I had been born even 10 years earlier, I wouldn’t have made it, without the advances that had been made in those ten years. And I cannot stress how important it is to “let them know that you’ve got their back.” That’s how I sorted out my true friends–were you there when I needed you? And the friends that were, we’re still friends, 15 years later. I myself discovered I had it at age 17, when my parents went on a cruise, and came home and my mom noticed that I “smelled like death”. My husband is also a cancer survivor, 13 or 14 years. He’ll have his extensive yearly check-up next month.We also are hopeful that a cure will be found in our lifetime. Thank you for raising awareness about this terrible disease! Wishing you a lifetime of good health. Thanks for your story. You make it all seem like such an Easy and Elegant Life that one would never guess all that might be going on behind the scenes. I think everyone today has someone they know who makes Think Pink more than a slogan. Oh, in the pink here -No one better to rally and put your strength in words with this eloquent post. Thank you, Chris, for the reminder. Having lost family members and dear friends to the cursed disease, I have been inspired to live a more elegant and chemical-free life. Small changes can pay big dividends…and it all starts with awareness. I raise my cup of organic tea and toast to your continued good health! Chris…so thoughtful. I have posted on my blog in honor of my cousin Sharon and have painted a work of art in remembrance. Thanks Chris! I am so glad you are here and teaching us all to lead a more wonderful life while we are here. Wishing you all good things for your healthy future! Thank you all for your kind thoughts; I’m a little overwhelmed. I remain “clear” which is a good thing. But this is not about me. As a survivor, I feel that we have a duty to shout from the rooftops to remind people that this thing lurks everywhere. It’s a damnable club of which to be a member and I’d like to close membership for good. Thank you for this reminder .. and here’s to many more healthy years to come your way! the voice of experience teaches like no other- cancer affects everyone it touches, directly or not. i can’t imagine facing down that monster once, let alone twice- thank you for sharing your strength with all of us.